The Board of Directors of the IKV Sponsors’ Association comprises the chairman of the Association, two deputy chairmen and a further four to six board members. The Board is made up of representatives from the raw materials, machinery and plastics processing industries as well as from the skilled crafts and trades. The Rector of RWTH Aachen University is one of the deputy chairmen. The Board of Trustees comprises representatives of the public authorities that have a decisive role in running the Institute through the provision of subsidies or other support, and also representatives from science, crafts and trades and the plastics industry. The Board of Trustees must include at least 15 leading figures from the plastics industry. The Board of Directors manages the Association of Sponsors and is responsible for carrying out the decisions taken by the Association. The Board also administers the Association’s assets. It is similarly responsible for drawing up guidelines for carrying out the work of the Association of Sponsors. It compiles and monitors the budget plan. The members of the Board of Trustees are elected by the general meeting for a term of four years. During this time, they advise the Association on economic matters and support the Board of Directors. 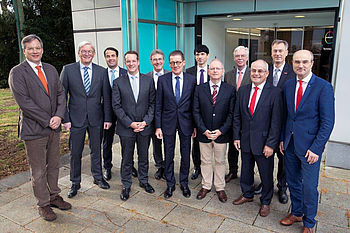 One of the key tasks of the members of the Board of Trustees is to maintain relations with representatives of the state, the business world and the industry associations in Germany and abroad who have an interest in the work of the Sponsors’ Association. Do you have any questions regarding the IKV Sponsors' Association?